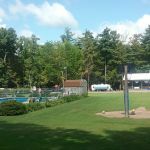 Ask fellow campers about "Moyer's Grove Campground" and nearby attractions. We had heard that Moyers Grove Campground had a great Halloween weekend experience for the kids. Well, it was a great time. They had a haunted house and a hayride that took you up there. My son and daughter got to dress up in their costumes and go trick or treating throughout the campground. They had a blast. The food was good and the nightly entertainment was excellent. If you have kids and want to do something with them during the fall then, I would take them here. As for our campsite, it was spacious. it was grass and hard pack dirt. There were full hookups and room to decorate for the kids too. There was a picnic table and a fire ring provided. Make sure to bring your own firewood. We camped at Moyer's Grove Campground in a Travel Trailer. Be sure to bring your fishing pole! We came because it was listed as a Passport America park. I called for availability and left a message. We went anyway because it was Monday and usually there is no problem on Monday. It is a long, windy road from the interstate. The lady said they are no longer a Passport America park. We paid the $30 cash. We did not get a campground map or receipt. She assured us we would get satellite reception. That is one of the reasons we chose this park is because a previous reviewer said there was a field with good satellite reception. She offered to change our site if we couldn't get good reception. She left and, of course there was no reception. We could not find her later. Call first for price and availability. It is not convenient for an overnight stop and you're stuck if you just show up. We camped at Moyer's Grove Campground in a Motorhome. My family were looking for quick camping getaway before my daughter started up school again, so we tried out Moyers Grove. After reading the reviews on here I was sceptical, but for the price we figured we would give them a chance. We had so much fun!! They had a ton of things to do like mini golf, fishing in two ponds, volleyball and the pool was very refreshing. My daughter had a ton of space to explore and go for hikes. On Friday they had an all-you-can-eat fish fry and even had breakfast on Saturday. There were activities during the day on Saturday and a fun DJ on Saturday evening. According to brochure, it looks like they have a lot going on during the summer and in the fall for families. The bathrooms were recently upgraded and were very clean. The shower I took had plenty of hot water and lots of room to change. The actual campsites were nice and rustic. We were on the creek side and enjoyed falling asleep to the sound of the water. Be sure to visit the campground store for supplies and collectibles. Just a quiet wooded campground for a relaxing weekend. It was an adventure to get to Moyers with the country roads, but it was worth the journey! We camped at Moyer's Grove Campground in a Travel Trailer. In reading a review from 2011, I saw that the men's room was out of service. Strangely, it still is! Maybe it's never going to be fixed and everyone just uses the same bathroom. No idea. My impression of the park is that it's beautiful and quaint! I took pics and was thrilled to see the river and the covered bridge you drive over to get into the park. Each site is fairly level and graded, with gravel as a base. Spacious sites, too. Picnic tables look very new. Now for the bad stuff: NO WIFI. And "no cell service unless you have Verizon." I have a Tracfone and did have service. Was able to stream things online via my phone too, but wouldn't have gone there at all if I'd known. Laundry facilities, large pool, nice sandy volleyball court, lots of pavilions and things, indoor covered mini golf for the kids, etc. Remote. Very windy and narrow roads going from the highway up to where they are. And steep initially. Bring your food and drinks because if you don't have a toad (like I don't) you won't want to navigate the RV back down hill to get supplies. Anyway, nice tables, fire rings, mine had some sort of BBQ pit with a chimney on it. I stayed only one night but like I said, I wouldn't have gone if I'd know there was no wifi or cell service, and its remoteness. Would have enjoyed staying longer, but not without wifi. The guy was helpful and friendly, the woman was distant. Just came and banged on the door when she came for payment (wasn't in the office.) Stood there and said nothing until I said, "How much?" No attempt at conversation. When I tried, she looked at me funny. I was only staying one night. Maybe that's why. We camped at Moyer's Grove Campground in a Motorhome. Bring your own wifi and prepare yourself cause you might not have cell service. Make sure you've done all your shopping and have no need to go back down for supplies for at least a few days. The roads are hairy. Enjoy the lovely river, covered bridge, and the other things. I'm glad I didn't know about the wifi cause I wouldn't have ever gone there. But it is lovely. Overall facilities are clean. Electric service does not have shut off switch at pedestal. Showers are lacking basic amenities, such as privacy, hooks, and a dry area for changing. Shower water temperature was not consistent. Unpaved roads with potholes led to puddles where insects were breeding. There are many full-timers here. Ducks and geese travel through to get to stream and pond. We camped at Moyer's Grove Campground in a Motorhome. 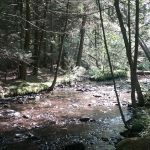 Close to Wilkes-Barre, PA, including local colleges, sports/concert arena, shopping, dining. Weekend activities available in summer. Very nice camp ground. Nice view over water - think river. We only stayed one night because of Passport America and set camp when it was dark. Not overly big rig friendly. Roads to and from narrow and tight turns. You can not just turn off the highway and get to the camp ground easy. Pull through but either us or the staff knew the height of the powerless inside the camp ground. Store Full of things - get little gem. We bought a fresh pumpkin pie. Must have been at least 3000 things to buy there. Everything from souvenirs to all sorts of food. We camped at Moyer's Grove Campground in a Fifth Wheel. Stayed a year ago, then again on 5/4/13. Men's restroom was broken in 2012; STILL non-functioning. Store is dirty; wouldn't buy anything in there. Rate went from $30 in 2012 to $37. Only people who stay here now appear to be full-time residents. Will not be back. We camped at Moyer's Grove Campground in a Fifth Wheel. Nice park in wooded/stream setting. The best part was the gentleman who led us out through twisting PA back roads to I-80 west. We camped at Moyer's Grove Campground in a Fifth Wheel. This site had all the makings of a great site. However, it has been taken over by seasonal campers and only a few spaces are used for over nighter. If you wish to stay during the summer then you will likely need a reservation. Other parks in the area are likely better for overnight. We camped at Moyer's Grove Campground in a Travel Trailer. We were assigned a site at the far end of the park. When we attempted to hook up our 50 amp electric, we found it was only 106 volts which meant that we couldn't use our A/C, microwave, electric water heater, vacuum cleaner, etc. Our surge/low voltage protector was unable to be used as it would not allow the low voltage into our coach. When brought this to the attention of the office, we were told "no one else has complained." We decided to stay as it was the only campground close to Nanticoke where we were doing genealogical research. All of the other trailers were permanent; most were not well kept. The two garbage dumpsters were full to overflowing when we arrived the Monday after the 4th of July and were still overflowing and stinky when we left Thursday morning. The laundry had six machines, two of which were non-operational. The garage they were kept in was open and had wasps and moths flying in and out. I chose not to do my laundry there! The only clean thing was the pool. They charge for everything they have...mini golf, paddleboats and air conditioning. The place is a dump!...and we would never return! We camped at Moyer's Grove Campground in a Fifth Wheel. Moyers CG provides the basics for the travelling RV'er. The people in the office are pleasant and were quick to respond when an issue was found with the electricity on our assigned site. The sites were clean and the playground area was enough to keep the children busy. The pool was closed for the season so I'm not sure if it was well kept. The bathrooms were generally clean but no soap or towels to clean hands. Overall, good place for a quick one/two night stay. We camped at Moyer's Grove Campground in a Travel Trailer. Looks like it is mostly seasonal with many things to do. We stayed one night and found it clean and quiet. Quiet hours are 12-8. We camped at Moyer's Grove Campground in a Motorhome. 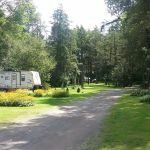 Are you affiliated with Moyer's Grove Campground ?